Kofi is passionate about growing small businesses. He has supported numerous Ghanaian businesses working in the oil and gas and related sectors over the past decade to strengthen operational systems and policies, which has propelled their growth. 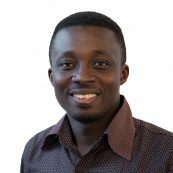 At PYXERA Global, Kofi manages the GE SME Development Program, a multi-year capacity building initiative funded by General Electric. Previously, he was the Technical Team Lead on the USAID/Ghana Supply Chain Development Program where he served as the main point of contact for international oil and gas companies, small and medium enterprises, and business service providers. He worked closely with local SMEs to meet strategic planning needs and overcome business challenges. Kofi’s diverse work experience includes local content development, project management, anti-bribery and anti-corruption, third party certifications, insurance, banking, lecturing, and HR management, both locally and abroad. He also specializes in targeted outreach and assessments to support CSR and livelihood enhancement programs. Kofi led the TRACE Certify the World campaign in Ghana where local businesses were introduced to Trace Certification and anti-bribery and anti-corruption resources leading many of them to receive due diligence and third party certifications. He is an alumnus of University of Cape Coast and University of Wales where he received a Bachelor of Education (Arts) and a Master of Science (Human Resource Management), respectively. He farms and raises livestock during his spare time.